The Lava™ All-Ceramic System from 3M ESPE™ encompasses a CAD/CAM procedure for the creation of all-ceramic crowns and bridges for anterior and posterior applications. 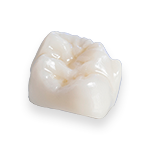 The framework ceramic consists of zirconia with a specially designed overlying veneer ceramic. The frameworks are made using CAD/CAM procedures (scanning, computer-aided framework design and milling) from pre-sintered zirconia blanks. The system produces high-strength restorations with excellent fit. The size of the final restoration has been increased to compensate for shrinkage during sintering.